The second panel of the “Drugs, Harm and the Campus” lecture series was moderated by the Dean of the Natural Sciences and Mathematics Ishita Mukerji. 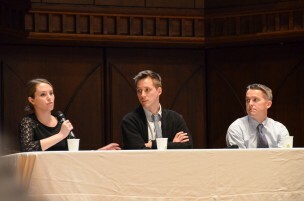 Students and faculty gathered in the Memorial Chapel at 8 p.m. on Thursday April 15 to participate in the second panel of the “Drugs, Harm and the Campus” lecture series. Dean of Natural Sciences and Mathematics Ishita Mukerji moderated the panel while Assistant Professor of Neuroscience and Behavior Mike Robinson, Drug Policy Alliance member Stefanie Jones, and Medical Toxicologist Dr. Mark Neavyn of Hartford Hospital focused on the physiology of drugs and spoke about the science behind recreational drug use and its possible long-term ramifications. In addition to providing empirical evidence with respect to the effects of synthetic substances, the panelists provided insight into how and why people use narcotics, while also addressing common misconceptions regarding drug safety measures. The professed goal of the talk was not to encourage or discourage drug use, but rather to shed light on reality so that people are able to make informed decisions about what they choose to put into their bodies. Robinson began the discussion by describing some of the reasons why people engage in recreational drug use. Robinson went on to address the transition from casual drugs to full-fledged abuse. He explained that although substance use is initially driven by a desire for intense sensations of euphoria, prolonged exposure often leads to increased tolerance of a given drug. With a higher dosage required to reproduce the same effects, the act of taking drugs is no longer done for personal pleasure, but rather as a necessity driven by cravings. After Robinson presented his research highlighting the long-term effects of minimal exposure to certain synthetic substances, Jones stepped up to the podium to explain her work with the Drug Policy Alliance. “The main thing you should come away knowing is that we’re trying to get society to treat drug use as a health issue rather than as a criminal justice issue,” she said. Jones further emphasized the importance of harm reduction through drug checking, which is a practice that has yet to receive widespread acceptance in the United States. The state of Connecticut considers drug-testing kits a form of drug paraphernalia, which makes possessing them illegal. She further mentioned that while such kits are reasonably accurate in detecting the presence of certain compounds in drugs, they are sometimes unable to recognize newer synthetics, and they often do not pick up on compounds present in trace amounts. This means that the only true way to recognize exactly what is in a specific drug would be to send it into a lab for more thorough testing; however, she noted that this method is expensive and inconvenient for potential users. Neavyn then brought the topic of toxicity into the conversation. He described the ways in which “club drugs,” such as Molly/MDMA, can sometimes have dangerous medical consequences due to their chemical similarity to hormones like serotonin, norepinephrine, and dopamine. As he concluded his presentation, Neavyn stressed the importance of recognizing the signs of an overdose so that people can be equipped with life-saving knowledge if they find themselves or others in a dangerous situation. After fielding questions from the audience, attendees reacted to the points raised during each of the lectures. Mikaela Vaneaton ’18 also reacted to the talk, sharing her frustration regarding the emphasis on the physical consequences of drug use without discussing the psychological ones. Director of Health Education and WesWell Tanya Purdy offered more safety information by highlighting the resources available on campus for people who are considering using drugs. The third and final panel discussion will focus on the policy debate surrounding drug use and will be held in Shanklin 107 on April 28 at 8 p.m.